Some people burn everything. Others forget to add salt. Me? My pasta water always boils over. But my biggest achilles heel in cooking is the constant temptation to add too many ingredients. It starts simply enough: asparagus with miso. But then I shake in a few dashes of soy sauce, and maybe some mirin, and wouldn't some rice vinegar be nice? Oh, and sesame oil too. Before I know it, I've created a murky mess. I didn't make a list of kitchen resolutions this year. At least not formally. But one commitment I made a while back that I've been trying to keep is to stay simple whenever possible. If I can make something delicious with five ingredients instead of seven, or three instead of five, I do. Especially now that summer has rolled around and the farmers' markets are juicily bursting with fresh favas and eggplants and peas and peaches and oh, tomatoes, I'm trying to celebrate these ingredients more simply. Tomatoes, salt, olive oil. No kitchen sink. It was this impulse that led me to the garden last week to pick some chives. The chives are doing beautifully, by the way; they started as two little bunches of skinny green spears, but now those spears are plump, and there are many more of them. Enough that you can't even tell where I snipped a few off the bunch. I had a few chives with flowers attached leftover from my CSA, and I wanted to find a way to celebrate my most favorite herb. 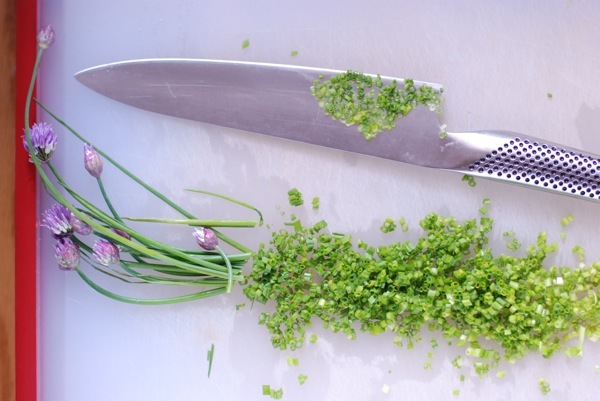 Typically, I dice chives finely and sprinkle them onto eggs, toast, and fresh chevre. Simple enough. But this time, I went for something even simpler, and I fell hard. 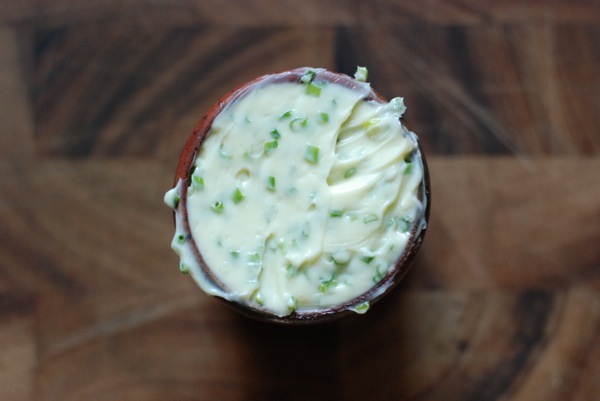 Chive butter. It's simple. Really, dead simple. Chives, butter, salt. That's it. If you're feeling the urge to make things more complicated, you might grate some parmesan cheese into the mix. I sat on my hands and resisted that urge, and friends, I have absolutely no regrets about the decision. Chives and butter are a match made in heaven. Aside from a little salt to wake up the palate, they need absolutely nothing else. The tricky thing about recipes as simple as this one is that the quality of each ingredient really matters. In a sauce with 18 ingredients, you'd hardly notice. But here, you need good butter, fresh chives, quality salt. Trust me: you'll taste the difference. So what should you do with this magical butter you've just made? First, before you do anything else: spread it on warm bread. Faint from happiness. Now compose yourself: there's more to do. You might finish a piece of grilled or roasted salmon with it. Or brush it on asparagus before broiling or grilling them. I bet it would be wonderful on halved, grilled or roasted tomatoes as well. And if finishing a steak or roasting a chicken with butter is your thing, well - don't let me stop you here. To serve the compound butter as a condiment, you've got a couple options. The first is to pack it into a pretty cup or dish and put it on the table, just so. If you've made a small batch, that should work perfectly. If you want to serve the butter on two or more separate occasions, I've provided instructions below. Just be sure to bring butter back to room temperature before serving. Simplicity at its best: that's pretty much the story. Combine all ingredients in a medium bowl and mix together with a fork until fully incorporated. Pack into a small dish or cup, and either serve immediately, or wrap in plastic and refrigerate for up to 1 week. To store for longer, wrap cup or dish tightly in plastic and freeze. Butter will keep this way for a couple months. Alternatively, butter can be refrigerated or frozen in smaller servings for use as needed. To do this, refrigerate butter for about 30 minutes - maybe less - until it's stiff enough to hold its shape. Then, set out a piece of wax or parchment paper on a flat surface, spoon the butter in a big clump onto the paper, and wrap the long edge of the paper around the butter, gently rolling it into a log. Use the short edges of the paper to pack in the ends of the log, and then wrap it up and stick it back in the fridge until completely solid. At this point, you can slice it into two shorter logs, or you can make individual disks of butter to use or serve whenever you feel the urge. Just be sure to let the butter come to room temperature before serving if you intend to spread it on bread.